Dr. James T. Giles III recently retired as a Lieutenant Colonel in the United States Army Veterinary Corps. His last posting was the Chief of Surgery for the Department of Defense Military Working Dog Veterinary Service. He is currently a small animal surgeon at South Texas Veterinary Specialists in San Antonio, Texas. He recently served as the senior veterinary surgeon in Afghanistan, providing medical support to Military Working Dogs in a combat theater. His civilian veterinary education programs and degrees include: Doctor of Veterinary Medicine, Oklahoma State University May 1998; Masters of Veterinary Biomedical Science, Oklahoma State University, May, 2007; Residency in Small Animal Surgery, 2004-2007; Diplomate of the American College of Veterinary Surgeons (ACVS). His clinical interests include wound management, Military Working Dog trauma, musculoskeletal and neurologic injury. He has been awarded the Legion of Merit, the Bronze Star as well as the 'A' Proficiency Designator, signifying the highest level of professional expertise in his military specialty, as well as the <br><br>His military education as a veterinary officer includes Officer Basic Course, Officer Advanced Course and Command and General Staff College. 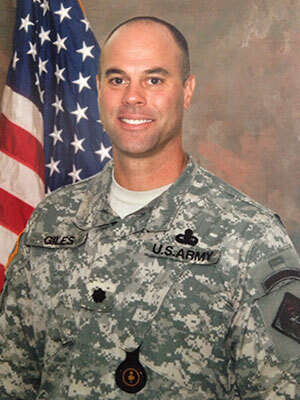 Prior to commission as a Veterinary Corps Officer, Dr. Giles served as a Special Forces Communication Sergeant and achieved the rank of Staff Sergeant. He has served in the 10th, 20th and 12th Special Forces Groups (Airborne). Dr. Giles is married to Kimber Giles, DVM and has two children.